The Sagittarius 2016 Love Horoscope forecasts that you will be able to control your love relationships as per your wish. There will not be any sweeping changes in the Sagittarius relationships. Marriages will be stable and singles will continue to enjoy their freedom. Presence of planet Jupiter will offer you with many romantic relationships in 2016. There will not be any commitment in these love relationships and they are more for fun and enjoyment. Sagittarius, you should be happy with socializing and partying with your love partner. Sagittarius in love will have excellent month in February 2016. Your communication skills and creativity will be very high in matters of affection. In the month of April 2016, you can merge your thoughts and beliefs to materialize your first dates into actual relationships. You have to curb your brashness and obstinacy and spend your time with the family in understanding their difficulties. Sagittarius traits show you can be supportive in offering solutions to their difficulties. 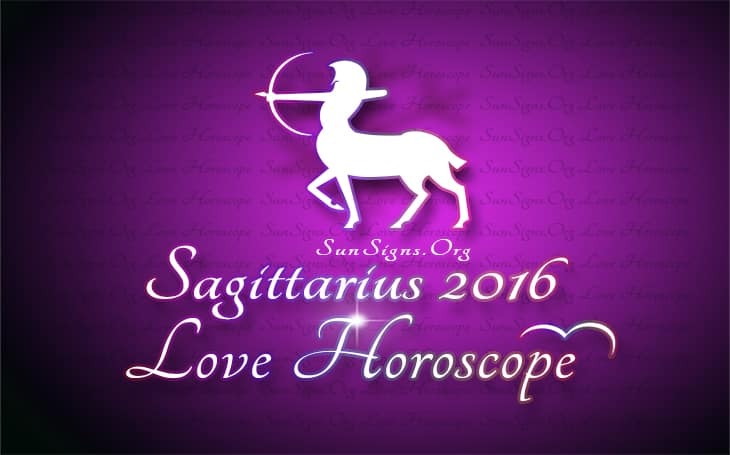 The 2016 Sagittarius love predictions foretell that you have to be vigilant in your relationship with colleagues and friends during the months of June and October 2016. Care has to be exercised while taking important decisions. Otherwise it may lead to frustrations, disenchantment or estrangements. The love 2016 horoscope predicts that you will be more confident and creative in your dealings with family members. Grown up children will seek more freedom and may decide to leave the family to chart out their own lives. Sagittarius zodiac people will have better outlook towards family in the year 2016 and will be more involved in family matters. Your stubbornness will be replaced by good perception. Flexibility and harmony will prevail in the family environment for the Archers. You should allow family members to express their opinion freely and allow children the liberty to decide on their objectives in life. Your narrow mindedness and traditional attitude towards marriage should be replaced by closeness, tact, patience and appreciation of other people. Mercury Retrogrades in the period from July to November 2016 will require you to be extremely liberal with your children. Otherwise there may be grave misunderstandings. Children will have prolonged affairs if they are of marriageable age. Marriages, breakups, divorces are possible for Sagittarians in 2016. Grown up brothers and sisters may get into committed love partnerships or even marriages. Love will be sexually sizzling in the month of May 2016 for the Sagittarius star sign. In June 2016 you will generously in love with your partner. In August 2016, both singles and married people will have more fun and frolic in bed with their partners. In January 2016, family relationships for the Archers will be under strain due to communication problems. Your relationship with your spouse will be more affectionate and passionate in February 2016. Relationship with children will be delightful and overall family environment will be enjoyable. Read more about this in the 2016 numerology predictions. During October 2016, there will be abundant opportunities for forming love relationships and single Sagittarians will have to use ingenious methods to find their soul mates. In November, these friendships will reach a higher level. During December, planetary positions are favorable to forge new partnerships or reviving the earlier love relationships. To conclude, the 2016 Sagittarius love horoscope foretells that love and romance will be plentiful this year, provided you make the right choices in life. Keep a look out for love 2017 horoscope for Sagittarius.